Find Johns Island, SC Homes for sale. View Photos, Maps and MLS Data Now! A two car garage with newly added automatic garage door opener and MLS#19011388. Dunes Properties Of Mt. Pleasant. A must see at a great price! MLS#19011448. Lighthouse Realty Group, Llc..
Come see the charm of this home. MLS#19011198. Carolina One Real Estate. Gift Plantation - Residents enjoy fishing, boating and HOA ammenities, and 14 miles to historic Charleston. MLS#19011135. Fathom Realty Sc, Llc. Rushland Plantation - (subject to community ARB approval) Architect/ builder Turn Key Feb 2020 completion Customize Interior Layout and selections now ! MLS#19011072. Ravenel Associates Real Estate. Llc. Shoreline Farms - A covered front porch spans the entire front of the house, MLS#19011183. Carolina One Real Estate. Enclave On Bohicket - The downstairs master bedroom has a luxurious master bathroom, fireplace & wood-paneled sitting area. Click for more info... MLS#19011014. Carolina One Real Estate. The Cottages At Johns Island - Three bedrooms are located on the second floor MLS#19010957. Prestige Real Estate Group. Enjoy a morning cup of coffee on the screened porch or glass of wine on the deck while grilling. 3 stop elevator shaft. MLS#19010898. Seabrook Island Realty. Do not let this special price escape you. MLS#19010939. Lennar Carolinas, Llc. It is just what you have been looking for today... MLS#19010919. Lennar Carolinas, Llc. See attached.The seller is a builder and could construct this for the buyer. X-Minimal Flood Zone MLS#19010741. Akers Ellis Real Estate Llc. Beautiful 12 acres on high ground with no history of flooding. It is a must see! MLS#19009912. Bhhs Southern Coast Real Estate. 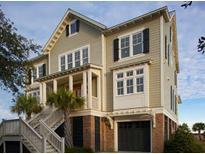 The Villages In St Johns Woods - Come experience ''Island Life'' at Johns Island's most intimate community! MLS#19010652. Pulte Home Company, Llc. Cedar Springs - Do not delay seeing this home or if will be gone. MLS#19010711. Creative Real Estate Services Team. Cedar Springs - Hurry this one will not last long. MLS#19010698. Creative Real Estate Services Team. Your low country retreat awaits you! MLS#19010490. Matt O'Neill Real Estate. Including: Estar appliances, radiant barrier in attic, Carrier PURON 14 SEER air conditioning, 80% AFUE gas furnace, HVAC ductwork insulated to R-8, tankless gas hot water heater, 3rd party tested MLS#19010376. Crescent Homes Realty Llc. Some of the many special features include a gourmet kitchen with 5 burner gas cooktop, large stainless hood, wall oven and microwave/convection oven, granite countertops throughout the kitchen and hardwood flooring throughout the first floor with wood tread stairs!Every home is built with eco-friendly features & high energy standards included: Energy Star Appliances, radiant barrier in attic, 14 SEER HVAC, Gas Furnace, tank less gas water heater, programmable thermostats, R15 insulation in exterior walls, LOW-E windows & compreh MLS#19010388. Crescent Homes Realty Llc. Staffordshire - A $2000 Lender Credit is available. MLS#19010462. Carolina One Real Estate. Upgraded trim throughout home. Exterior Hardiplank. MLS#19010321. Lennar Carolinas, Llc. Tile in baths and laundry room.Huge backyard... June close date MLS#19010310. Lennar Carolinas, Llc. Screen porch to enjoy your pond view. Closing July/August MLS#19010323. Lennar Carolinas, Llc. Do not wait this is a great home, fabulous homesite and at a great value! ! MLS#19010327. Lennar Carolinas, Llc. Tremont - Lots of new restaurants and commercial developments going in near by. MLS#19010092. Coldwell Banker Residential Brokerage.